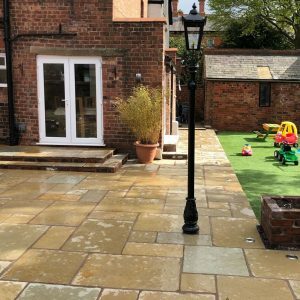 Tumbled and Brushed Indian Stone paving is a natural product which closely resembles reclaimed Yorkstone but at a fraction of the cost and is far easier to lay than reclaimed stone. Tumbling the stone produces a soft and rounded feel whilst brushing the surface after tumbling creates a distinctive smooth and interesting finish. Paving Traders’ Tumbled and Brushed Range can be used internally and for design projects where the flooring continues from inside to out. The Tumbled and Brushed Indian Stone range will bring a touch of classic agelessness to any setting. It is ideal in any location whether that be older properties and renovations such as barn conversions, or more contemporary projects. Available in a range of colours to satisfy any design requirement, the sheer timeless beauty of this wonderful product will give pleasure for years to come. 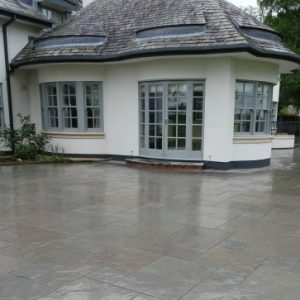 Like all products in the Paving Traders portfolio, we offer only the finest Indian Stone direct from our quarries so we know we can’t be beaten on price.